What accordion will give you the typical Slovenian sound? When I started my search for a piano accordion with a typical Slovenian (Oberkrainer) sound (see Avsenik, Alpenoberkrainer, etc), I had no idea what to look for. Further information was hard to obtain through research of my own, so I had to turn to contacts from central Europe who were happy to explain what they use and what makes the sound that we know and love (as well as using Google Translate on German and Slovenian accordion forums). I hope the following information can assist anyone who is looking for that sound and not sure where to start, particularly outside of central Europe where it is difficult to find this information. Please note this also applies for chromatic button accordions. Please only take this information as guidance; there's no solid rule about the accordion you should use. If you're able to, try as many as you can for yourself and choose the sound and feel that you like. There's no right or wrong. Which alpine sound are you looking for? Do you prefer the Oberkrainer sound, or the button accordion (Steirische) sound? Both are available on piano accordions, but it will affect the accordion's tuning, construction, weight and price range. If you aren't sure, look around on YouTube and give different bands or accordionists a listen. Once you are able to hear the subtle differences, you will eventually notice two distinct types of sounds: some boxes sound like Steirische/Slovenian button accordions, and some have a distinct, different, Slovenian Oberkrainer sound to it. If you don't mind either sounds or don't have a preference, that'll make your purchase a lot easier (the cheaper one!). On the other hand you may prefer one over the other, as many do. If you do, here's what you will need to look for. Piano accordions which emulate the steirische harmonika sound feature a 3 reed musette tuning and helikon basses. 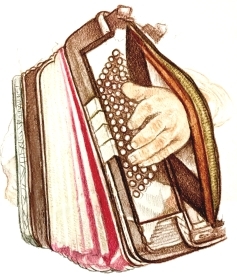 Most alpine accordion brands offer these types of accordions in their non-casotto variants, often using the naming convention of MH (musette and helikon). These accordions are typically cheaper as they do not feature cassotto, and often feature high quality Tipo-a-mano reeds instead of the more expensive and higher quality A-mano reeds. I believe some cheaper brands use lesser quality reeds than either of those, which you may as well avoid. Higher quality reeds will give you a louder, richer, brighter sound compared to the lower quality reeds. Full 3 reed musette: 3 middle octave reeds tuned apart from one another to produce a degree of 'wetness' or 'tremolo'. These boxes aren't tuned too wet though, otherwise they'd be heading into French musette territory. Often abbreviated as MMM. Additional reeds such as the lower or higher octave can make the accordion more versatile, as it can produce different sounds suited to more styles. No cassotto (also known as tone chamber). Helikon basses: larger and wider bass reeds which produce a deeper sound, like the steirische harmonika basses. In my opinion they don't sound identical to a real button accordion's helikon basses (but I loved them until my tastes changed). However more recently, they are becoming louder and deeper with newer developments. Many brands currently offer these accordions but they are also available second hand. Earlier on, only Zupan sold these, however nowadays many brands offer these accordions. Those brands include but are not limited to: Beltuna, Fismen, Rutar, Alpengold, Rutar, Mengascini, Kaerntnerland and so on. There is also the Weltmeister Monte from Germany which served me well until my tastes and needs changed. This is the sweeter, mellower sound that you will hear from most Oberkrainer style bands who use a piano accordion. It's become the standard for this style of music, and really suits it well. That's not to say you can't play this music on a non-cassotto accordion; in fact, don't let anyone persuade you to get a certain accordion because of what they think. Follow what sound and style you love the most. If you are looking for this sound, there are many different options, but they all share the one feature: 3 reed musette tuning with the straight tuned reed sitting inside a tone chamber or 'cassotto', mellowing the sound emitted from that reed (here's a link to a Wikipedia article that provides a great summary of cassotto). The musette-cassotto combination dramatically changes the musette sound, creating a smoother, sweeter, mellower sound that you will hear from most Oberkrainer bands from Europe since around the 1960s onward. Slavko Avsenik got onto it early in the 1960s with the Excelsior 1320s. Before then, it was more common to choose dry tuned musette boxes including the Hohner Verdi and Hohner Atlantic. In fact before Avsenik moved to musette-cassotto accordions, he performed and recorded for several years with a Hohner Verdi III﻿ B. The basses on these accordions are typically not helikon bass. They are however, 4 to 5 reeds, and often feature bass cassotto, which to my understanding is not an actual tone chamber, although the reeds are positioned differently to produce a richer sound. This technique is called Winkelbass in German. My Fismen Proline has this, and the basses sound chunkier and brighter than other accordions - I like it a lot. Different brands and models will use different reeds, construction, wood and tuning, therefore all accordions will vary with how they sound and feel. Below the most common musette-cassotto accordions that are used. Hohner Morino VM - produced in the 50s and 60s in Germany. 5 reeds on bass and treble. Slavko Avsenik played it in most recordings from some time in the 1960s till his final recordings. This is still the go to instrument for the classic Avsenik sound, although apparently the mechanics are dated and its wooden keyboard is an old 'waterfall' style, hence some find it not ideal for playability, and some prefer it. Many accordionists still aspire to own a Morino VM. The Morinos are also popular in other types of music as they are extremely versatile (as most 5 reed cassotto accordions are). I've tried a Morino VM before, and the sound was just incredible - loud and full, just on the 3 reed musette register. The keys would take getting used to for me, but this is because I'm used to playing newer accordions with smoother, narrower keys compared to the VM. You can see lots of demos of the Morino VM on YouTube. The VM has also inspired some newer oberkrainer style accordions in looks and sound. I will discuss these later. Hohner Morino VN and VS - produced in Italy by Excelsior (and possibly some of them in Germany) in the 60s to 80s. 5 reeds on bass and treble. Apparently they don't resemble the VM in construction or materials, and it is also heavier. Some people describe the feeling of the keyboard something to get used to (but it depends on the individual). However many bands have performed and recorded with these accordions since the 1960s, and it has the very round, sweet sound that has become the standard. In my opinion the sound is thicker and wetter than the classic Morino VM. Excelsior 1320s - produced in Italy by Excelsior. Although this isn't as common as the Morinos or Zupans, it can be heard on many of Avsenik's recordings from the 1960s, before he moved to the Morino VM. In my opinion it too had a thicker, wetter sound. Zupan Alpe V EA or IV EA - initially produced in Slovenia and then in Italy. The V models are 5 reeds bass and treble, and the IV models are 4 reeds bass and treble. Usually the EA models treble range span from E to A (unlike the Morinos), and feature musette with cassotto. This became the standard in the 90s and has influenced most of today's oberkrainer style accordions in sound, feel and aesthetic. The sound is closer to the Morino VN/VS than the Morino VM, but it is still its own sound in the end. After so many years I can tell apart the Zupan sound from the rest. I've tried a 90s V EA (I believe made in Italy) and it felt only as heavy as my current 4 reed 96 bass Fismen. The sound was bright and Morino-eqsue, and the mechanics were smooth. It didn't feel very different to my Fismen at all. These are still being produced, however to my knowledge by a different manufacturer than previously. Hohner Alpina - produced in Italy. All sources indicate that it should be very similar to the Zupan Alpe. Its aesthetics and sound is inspired by the Zupan. There are also button box style Hohner Alpina piano accordions. There are others which have been used for this style of music, including the Hohner Gola, Hohner Imperator and others. If you live in Europe or are planning to visit soon, I personally recommend going for second hand rather than new accordions, since their availability seems so high and it's a much more affordable option for not much of a sacrifice. In my opinion, there aren't many advantages of getting a brand new accordion. The benefits of getting a used one however include the dramatically lower price, and the fact that it has already been 'played in' - it has already reached its loudest and fullest sound, and its best playability. However if you are looking to buy a brand new accordion, here is what I have learnt from my own experience. Beltuna (Italy), Fismen (Italy), Rutar (Slovenia - but have recently moved to Austria), Zupan, Munda (Slovenia), Alpengold (Austria), and so on. Every now and then a new brand pops up, and it's hard to tell whether they simply order accordions from Italy to their own specifications (or very little specifications), or actually play a part in manufacturing some part of the accordion. This is the hardest information to pin down, as some companies will lie about their involvement in manufacturing the instrument. Number of treble reeds, number of basses, M for musette, and C for cassotto. 496CM: 4 reeds, 96 bass, cassotto and musette. They are also available with helikon bass but it is not the typically chosen option. Most of these come with A-mano reeds - apparently the highest quality reeds produced in Italy at the moment. From my own experience, these take the longest to develop their fullest, brightest sound, but are brighter and louder than the other types of reeds. I'd like to mention Alpengold, whose Krainer models I am eager to try due to their sound. You can find videos on YouTube of the Krainer VM model which I think sounds very close to the classic Hohner Morino VM. The visual style of the accordion also seems to be inspired by the Morino VM. Rutar, Munda and Fismen also seem to sell some accordions which seem inspired by the Hohner Morino VM in terms of looks and sound. Keen to try these too. Hohner still makes variants of the Morino, however many people say that these to not resemble older Morinos in any way, and still bear the high price mark, despite some of these models carrying the Avsenik name. I hope this can assist anyone with their hunt for a Slovenian or Oberkrainer style piano accordion. Please leave a comment if anything I've written is factually incorrect, or if you have any questions or additional information that could be helpful for other accordionists! Edit: There is a third Slovenian sound which is utilised on piano accordions; the 'Cleveland' style sound most utilized by American Slovenes. This seems to be typically achieved on a musette, non-cassotto accordion. However the difference here is that the musette is 'dry' tuned - that is, with less tremolo than the musette sound used in Europe. Congratulations on your Morino VM! I agree it really is incomparable, and I hope to own one one day.